Due to increased workload and the growing popularity of this site, I am pleased to announce that Patrick Kiser is now a Co-Host of "Die Gebirgstruppen". He will help me with updates and new material to keep this site fresh and viable. 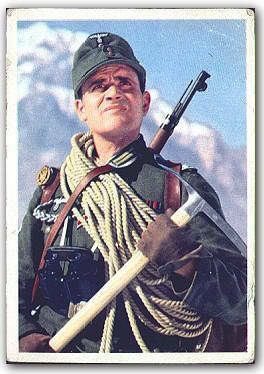 Patricks wealth of information on the German Mountain Troops and his dedicated Gebirgsjäger collection will prove to be a valuable asset to this sites future growth and development. This Site is non-political and not interested in any form of Fascism or any Neo Nazi organisations; it is a study and resource of military history and the Warfare of World War Two. 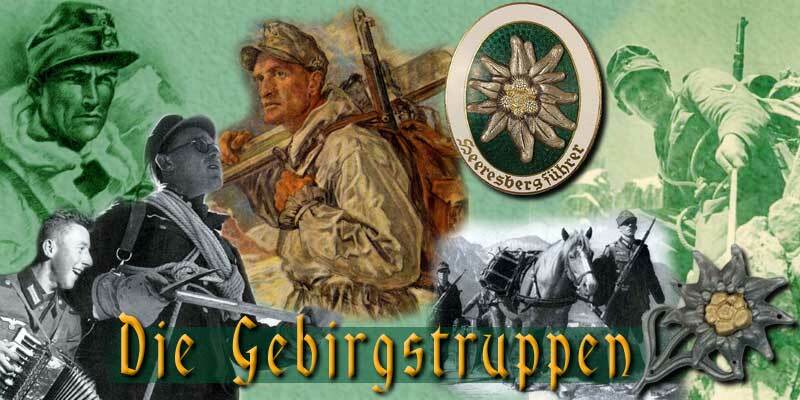 The aim of this site is to provide a resource of information about the Gebirgsjäger Mountain Troops during World War Two, and we will endeavour to cover all the Gebirgsjäger Divisions in some detail in the future. If you have some information or images and would like to contribute, feel free to do so, contributions are always welcome. Please Email any suggestions or comments to the Webmaster Peter Denniston, or History and Collecting questions to Patrick Kiser. For best results Please view at 800 x 600, Hi Colour and turn off "underline links" in your browser preferences. I would like to thank the many people who have given me ideas, material, encouragement and the use of equipment that make this site possible. Firstly, Freeservers for the use of their server; Andrew Burke, Jason Pipes, Patrick Kiser, Christian Schauerte, Hans Kopold, Daniel Glatt, Peter Linau, Neil Hever, Brian Fischer, Alberto Turinetti and Terry Marshall, for influencing the quality of this site.